Age : The age of candidate should be between 21 to 40 years as on 01.07.2018. Here on this page you will get the details like the Name of vacancies released by UPPSC with exact number of posts. Some other criteria like Education details, application fee and way to apply application for UPPSC recruitment 2018. Educational Qualification: Graduate from a recognized University with B.Ed. For Computer Teacher: Graduate in Science in Computer Application OR Graduate in Computer Application OR candidates with BE/ B.Tech in Computer Science OR Graduate with a level Course OR any other equivalent qualification & candidates must have done B.Ed or any equivalent Exam. Fee charges: Applicants who wanted to participate for UPPSC should pay the below charges through Net Banking or Card Payment or other payment mode. 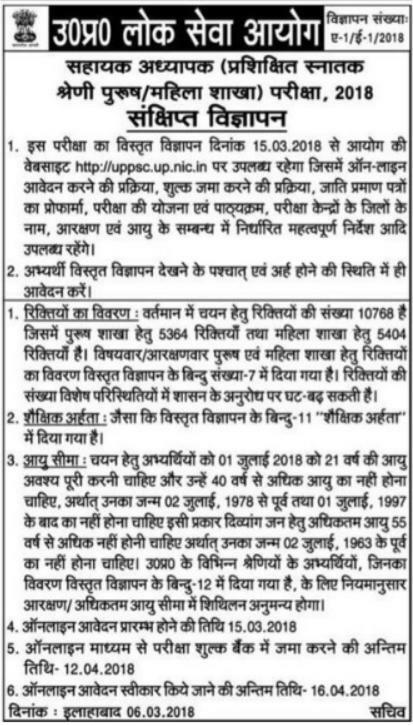 Interested and eligible aspirants may apply online through the website www.uppsc.up.nic.in from 15.03.2018 to 16.04.2018.